Are You Eligible to Invest in Stocks? Based on valuation levels today and the true “Risk Capacity” found among investors, most households would probably not qualify to own stocks in any significant portion. This is an important update for everyone. Understanding Risk Capacity is critical to your survival as a career investor. Most don’t have a clue what that means and we are approaching another moment when it really matters. Are You Part of the 1% Club? The rich are getting richer, the poor are getting poorer and the middle class is about to find out exactly how little tax reform is going to help them. Don’t be surprised in a year or two when you recognize that a system governed by billionaires tends to favor billionaires and the wealth gap in our country will become wider than we have ever seen. So what does it take to be in the 1% club these days? According to Forbes, the top 1% income is now 25 times the average income of the other 99%. In some states and havens for the rich, like New Jersey, Jackson Wyoming or Stamford CT, you have to make over $1.25M/ year to qualify. What’s the point? Income is a key determinant of one’s capacity to take on risk. Now risk comes in many forms but, let’s limit this conversation to investment risk and even more specifically, the risk of owning stocks at today’s prices. I will argue that at today’s valuation levels, few beyond the true 1% in our country, really have any business reaching for big stock allocations, owning overvalued securities or anything in between. On a purely empirical level, most investors simply don’t have the necessary Risk Capacity to own what they own today. Risk Capacity with regards to owning stocks today is just like it sounds. It is our ability to tolerate adverse events without those events impacting our daily decisions, lifestyle, our ability to service our debt, our legacy plans for future generations, etc. Adverse events are code words for deep corrections or bear market losses in excess of 20%, a job loss, a costly health issue or any other negative factors. Risk capacity is really about our dependence on our current investment balances for any reason. Before getting into examples, let’s touch base on current valuations. They are high, very high, and now above the levels that we saw in October of 2007, just prior to the last “Adverse Event”. Bespoke did the numbers this week looking at valuation levels across sectors. It’s hard to find anything attractive – maybe telecom? Now let’s add another graphic to the discussion courtesy of Kitces.com. 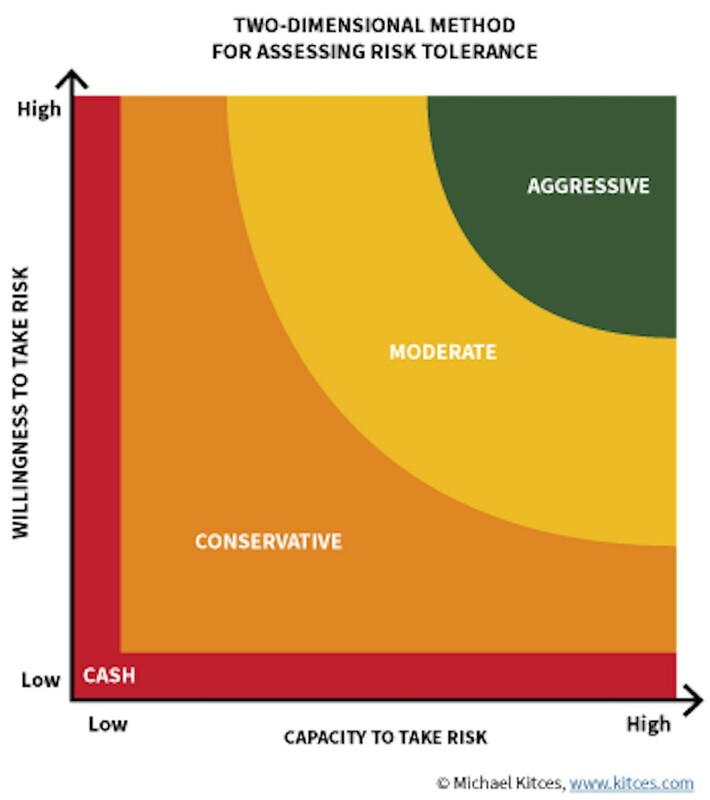 This one offers a nice matrix to help you understand how Risk Capacity and your Willingness to Take on Risk dictate a very different orientation to the market than you might expect. Let’s get back to the 1% as our first example. This crew has very high-risk capacity (way right on the horizontal axis), mostly by income but also as a function of net worth and general resiliency in the face of bad outcomes. The 1% are naturally accredited investors as per the IRS and the SEC meaning they can afford to lose a great deal of investment capital without compromising their lives or the lives of others. They are able to service their debt rain or shine and they do not live hand to mouth in any way, including withdrawing any significant amount of investment capital out for living expenses. They live on a fraction of the income they earn and generally don’t touch their investments beyond adding to them regularly. Effectively they will never outlive their money so their money has a very long time horizon, like multigenerational. Note, the investor’s age has very little to do with time horizon. The 1% are quite savvy with personal finance and have arrived at this level of wealth through personal effort, taking prudent risks, investing, education and of course some degree of entitlement (born in the right place at the right time). Looking back at the chart above, we see that IF they are also willing to take on risk, then they qualify to run an “Aggressive” portfolio, presumably very heavy in stocks other risk assets. Note- the Aggressive portfolio option is the very smallest of all available options. You must have both a high level of risk capacity and high willingness to take risk. Practically, for the many 1%’ers that I have served over the years, few are really willing to take on a lot of risk despite their high risk capacity. They recognize and respect what can happen in a stock-heavy portfolio and they just don’t need the brain damage given their net worth. They are more interested in consistency, a moderate return and high capital preservation (our offering). They quantifiably have a moderate tolerance for risk and therefore end up with portfolios that would correlate to the inside edge of the yellow “Moderate” arc. Now let’s look at another example, the opposite case in fact. Let’s create an investor household who maybe youngish, who has not really experienced the harsh realities of a bear market and who is just starting their wealth accumulation. They might even have a healthy job (s) that pays their bills but doesn’t leave much in the way of savings or discretionary income. They are starting families, buying first homes, and ramping up. There is no shame in this; We all started this way. It is what it is. Our industry would say, “hey you’re young, you have a long time horizon, you should be all in, almost 100% in aggressive stocks or concentrated stock index funds at the very least.” But when we consider Risk Capacity for this investor, it presents a different picture. Their risk capacity is actually, quite low because they don’t have any buffer against adverse events at this stage. Or, in the event of a job loss, they regularly need to access investment accounts to cover today’s living expenses. In my experience, those who have little or no buffer against job loss or declines in investment portfolios are always the ones that tend to sell everything at the lows and be more reactive to adversity. It’s really common sense. When there are mouths to feed and you don’t have much to lose, risk capacity is actually very low. Here again, the classic Time Horizon argument is deeply flawed when behavioral economics comes into play. This household clearly has very low risk capacity until they either make more income or build up their investment portfolios. The common error I see is that this household of new investors often thinks of themselves as highly willing to take on investment risk (high on the vertical scale). While that might be the case, their position in the horizontal scale is still firmly set to the left. Plotting these two, our second household couldn’t/shouldn’t have much more than a very conservative portfolio (ie very few stocks as a percentage of total). We must ask ourselves some basic questions about risk and opportunity when designing our portfolio. Answers based on Risk Capacity and Willingness to Take Risk are actually pretty cut and dry. One simply needs to acknowledge who they are, where they are in their financial lives and their real tolerance for adverse events. If those are honest assessments, our portfolio design should follow. But, we also have to weigh in the current conditions of the markets (stocks, bonds and commodities). 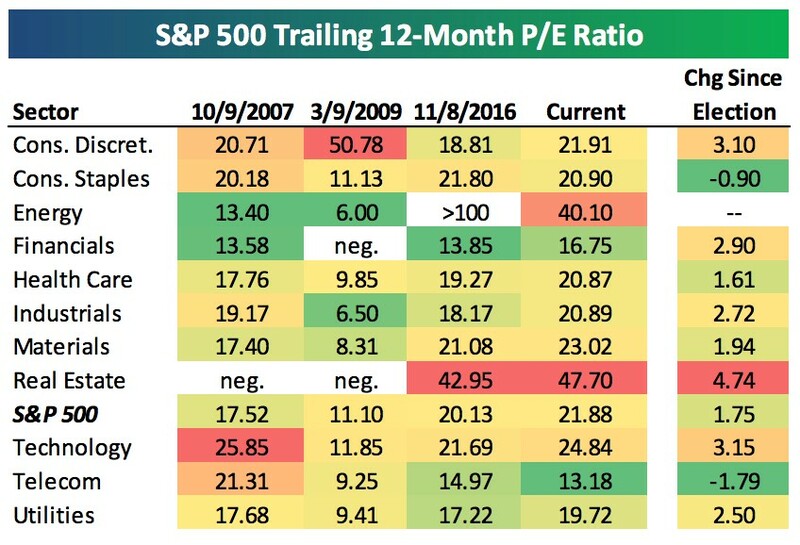 When things are as overvalued as they are today, we have to know that someday, perhaps some day sooner than you think, we’re going to start seeing some “adverse events”. Today, I hear TV guys shrug and say, yeah we should expect a little more volatility in 2018. A little more volatility? So, if we’re trying to decide what kind of investor we really are, and we’re wrong or deceiving ourselves in some way, the markets will not be very forgiving given today’s valuations. When things are cheap, you can make allocation mistakes and still make money. This is a critical time to be real and honest about your personal risk capacity. If you have migrated to a heavily exposed stock or stock index portfolio in the last several years following the returns, you still have time to make changes if you shouldn’t be there. We’re here to help if you need it. Sorry for the lecture but it’s that time.